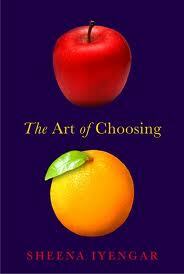 The Art of Choosing | Que Sera Sara? 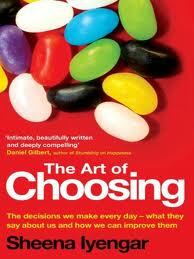 Sheena Iyengar’s study, The Art of Choosing, is a thought-provoking work. Taking in theories of economics, sociology, philosophy, psychology, and even politics, it asks in no uncertain terms ‘What is Choice, and why does it matter?’. Choice, she argues, is a tool and a langauge. Choice is an act, not an outcome, and thus an ongoing element in the construction of one’s life. Perhaps crucially in the age of super sizes and optional extras and infinite variety, this book explores the murky terrain where expectation, aspiration and impetus meet. For choice is inherently an act of freewill; an opportunity to express yourself, define your life and strike out on the path most suited to you – or at least most suited to the you you want to be. Increasingly in the modern, western world, our identity is bound up in the choices we make. The decisions we take. The roads we travel. The lifestyles, careers, partners and even brand of dish soap we buy pick, in some ways, define ourselves. The book views Choice thought a prism, breaking down these meanings and functions, and examining them in turn. The freedom to choose creates a world of opportunity and options but it also contains notions, both recognised and subconscious, cultural and social, which limit and define us and our ultimate choices. It is tempting to promote choice as the great equalizer – after all, that’s what so many dreams, including the American one, are built on… [The] promise of choice, the language of choice and even the mere illusion of choice have the power to motivate and uplift us. We should not, however, take this to mean that faith, hope and rhetoric alone are sufficient. For instance, does feeling like you have a choice make a difference? Yes and no. In the studies cited perceiving freedom of choice (real or imagined, depending on the test) can contribute to a sense of well-being and ownership fundamental to many people’s happiness and longevity. But a proverbial rock-and-a-hard-place choice can often be stressful and even harmful to choosers. The swift and enthusiastic narrative clearly demonstrates her love for her subject, and her long years as a college lecturer. The prose is peppered with cultural references, personal asides and colloquialisms. It’s an easy read with provocative insights, which can sit comfortably alongside other the mass-market non-fiction such as Freakonomics and the works of Malcolm Gladwell. But as a groundbreaking researcher, Iyengar brings a style and command of subject which are all her own. Many of the studies cited were run by her colleagues, assistants, and on occasion herself. This lends a casual air of authority and deep understanding of the matter at hand, and still manages to avoid feeling claustrophobic-ly collegiate. Pulling on poetry, art and culture as much as neurology and economics, this is a powerful exploration of one of our most valued assets in all its perplexing multitudes. While it is unlikely anyone will agree with all her challenging ideas (and many of the studies included are bitter pills to swallow in a world where the Freedom of Choice is hallowed), it is precisely this difficulty which makes the work so vital. Though however strongly I may recommend it of course, the choice is ultimately yours.